About a month ago I was given the opportunity to engage with the “Seven Grandfather Teachings 28-Day Reflection Journal” by Kelly Frantastic Davis. I say engage because you don’t simply read a reflection journal, you interact with it and if it’s any good, you find yourself engaged with the content, concepts, and the growth it evokes from within. This reflection journal really captured my attention, and engaged me daily. It allowed me not only learn about the teachings themselves, but apply them to my life and circumstances. By Day 28, I was lamenting that there wasn’t a Day 29; I wanted to continue my personal journey with these teachings. The journal itself is structured for 28 days, and suggests that you dedicate ten or fifteen minutes at the beginning of your day to the entries. 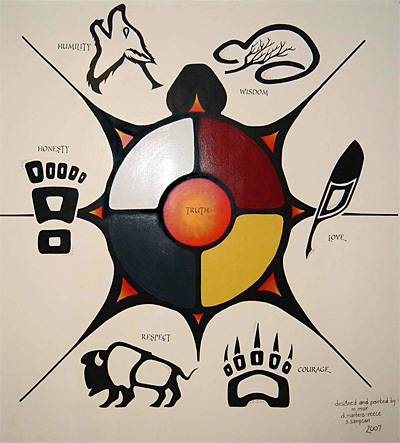 Each day is a different teaching, based on the Seven Grandfather Teachings of the Anishnaabe People: Love, Honesty, Wisdom, Truth, Bravery, Respect, and Humility. Every entry includes a motivational quote, the author’s personal reflection of the quote, and ample space to record your own thoughts and reflections. I appreciated the personal stories that Frantastic shared with readers, a good reminder that each of us travels a road that is not always paved. In the introduction, Davis states: “This reflection journal can be effective for the reader in terms of enhancing, empowering, and providing guidance while making positive changes in their life.” (p2). I really enjoyed my experience of this 28 journal, and recommend it to others. As I read the author’s quotes and reflections, I revisited experiences of my youth, and reflected upon the current world around me. Some days I wrote furiously in tiny script (always with my favourite purple pen) so that I could fit in as much as the paper would allow me. Other days I would write concisely, with short notes that danced all over the page, and other times I found myself sketching images or doodling creatively around my words. The time I spent each morning also allowed me to start the day in the right headspace, and the teachings seemed to guide how I interacted with the world around me that day. Journaling is more than simply words on paper; it’s about processing your emotions, thoughts, and experiences in whatever way moves you. Journaling teaches you about yourself, and it should inspire inner growth and movement forward. During my 28 Days, I had numerous ah-ha moments, several times where I breathed a sigh of relief as I purged unwanted energy and felt I could move forward more positively. Near the end of the journal – while I was writing my own thoughts – I had a particular moment that tied everything together for me with these Seven Teachings, and I wrote it in the front of the book: Living your Truth allows you to embody Humility, Bravery, Wisdom, Honesty, Respect, and Love. For me, Truth was at the core, and all of the other teachings branched from it. 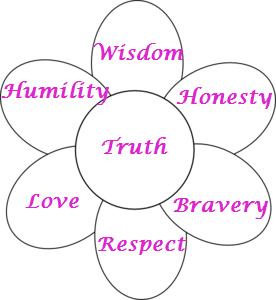 I doodled a flower with six petals, and wrote Truth in the middle and the other six teachings on each of the petals. I realized that at the time I was writing the 28 Day journal, fully understanding My Truth was important for me. I could easily see how these petals could shift and move, with each taking their turn in the middle. 1-Nibwaakaawin (Wisdom) To cherish knowledge is to know Wisdom. 2-Zaagi’idiwin (Love) To know Love is to know peace. 3-Minaadendamowin (Respect) To honor all creation is to have Respect. 4-Aakode’ewin (Bravery) Bravery is to face the foe with integrity. 5-Gwayakwaadiziwin (Honesty) Honesty in facing a situation is to be brave. 6-Dabaadendiziwin (Humility) Humility is to know yourself as a sacred part of Creation. 7-Debwewin (Truth) Truth is to know all of these things. These teachings are universal, and they offer us a tool to good health, and spiritual, emotional, physical, and mental wellbeing. More information about the Teachings of the Seven Grandfathers can be found on Wikipedia. The Gifts of the Seven Grandfathers discusses origins and offers audio so you can hear the teachings. A PDF of the Seven Sacred Teachings can be found HERE. My thanks to Frantastic Davis for the experience. This entry was posted in energy, medicine wheel, native and tagged medicine wheel, native, seven directions, spiritual. Bookmark the permalink. I appreciate the 7 teachings, but I think we need to go further. For example, “respect” is pertinent OUTSIDE the context of heartfelt love. When we love someone, we don’t think in terms of “respect” but rather adoration and appreciation and honor. Respect is the polite, tame substitute we adopt for people we don’t have loving relationships with. Bravery, similarly, is a weak substitute. Which is more effective and competent: facing the foe bravely or becoming so powerful that presumed “foes” pose little to no challenge? Bravery is required only so long as we hold the “foe’s” power in high estimation relative to our own. So, bravery is actually a measure of our relative weakness, not strength. It’s a wonderful second-best, because it’s better to face daunting odds instead of cowering before them. But it’s not nearly as good as learning ways that our “foes” are defenseless against. Copyright 2013-2014. All written content is the intellectual property of Tracy L.M. Kennedy (unless otherwise stated). Any material used must be cited and referenced properly.